CHICAGO – As far as punk rock electroclash bands go, concertgoers would be hard pressed to find one as vibrant, charismatic and thrillingly alive as Le Tigre. It’s a band that I had no knowledge of prior to viewing this documentary, and though the film itself is a rather unexceptional tour video, it has made me an instant fan of the group, whose witty and catchy rhythms are simply irresistible. Comprised of former “Bikini Kill” vocalist Kathleen Hanna, Johanna Fateman and Jocelyn “JD” Samson, Le Tigre is entrenched in the feminist politics and DIY aesthetics of the “riot grrrl movement” that came to fruition in the early ’90s. Their work promotes both female empowerment and LGBT equality, while their performance style is both playful and impassioned. A series of well-edited concert montages effectively convey their onstage exuberance, but there’s little in the offstage footage that’s of much substance. At a slight 72 minutes, “Who Took the Bomp?” mainly consists of cinematographers Carmine Covell and Paul Kloss following their subjects on a 2004 tour for their album “The Island” (the band performed its last public concert a year later, and is currently on hiatus). Though the picture doesn’t aspire to be a polemic on the level of Barbara Kopple and Cecilia Peck’s excellent Dixie Chicks documentary, “Shut Up & Sing,” it never develops a personality of its own. Director Kerthy Fix captures few intimate moments with the band mates, who spend most of their screen time mugging for the cameras. It’s certainly pleasant hanging out with this group, but it’s a shame the filmmakers couldn’t get further under the surface of their personas. Jocelyn Samson, Kathleen Hanna and Johanna Fateman star in Kerthy Fix’s Who Took the Bomp? Le Tigre on Tour. Only when Jane Magazine refuses to put the word “lesbian” on a promotion for the band does the film become something more than a standard celebrity portrait. In a single reaction shot, we see Samson convey a subdued disappointment that speaks volumes about her inner drive to champion tolerance through her work. Samson’s boyish features attract audience members of all genders and orientations, and she admits that the audience’s embrace has furthered public acceptance of her sexuality. Her song “Viz” is a deeply personal exploration of her life as a minority, and it emerges as one of the film’s highlights (Samson’s iconic status would make her an ideal singular subject for a documentary). Who Took the Bomp? 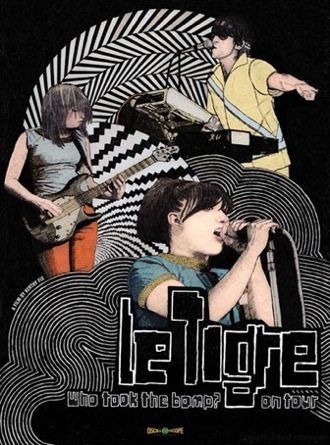 Le Tigre on Tour was released on DVD on June 7, 2011. Contrary to the special features list on the box, which indicates the inclusion of “video commentary” with the band, there is no feature-length commentary to be found on the disc. Instead, there’s a recent 28-minute interview with Le Tigre in which they briefly comment on a few clips from the film, while mainly reminiscing about their time together. It’s a thoroughly entertaining half hour that provides greater insight into the band itself. The women candidly discuss their hypersensitivity toward discriminatory behavior committed by everyone from creepy DJs to queer-negative promoters. Hanna opens up about her reasons for leaving the band, which included the gradual damaging of her vocal chords, and her worries that she was starting to resemble a “feminist Barney.” Regardless of her reasons, this interview proves that the grrrls’ chemistry is as engaging as ever. ‘Who Took the Bomp? Le Tigre on Tour’ is released by Oscilloscope Laboratories and features Kathleen Hanna, Johanna Fateman and Jocelyn Samson. It was directed by Kerthy Fix. It was released on June 7, 2011. It is not rated.